Who invented photography first, Fox Talbot or Louis Daguerre? Who got the patent? Who made the most money? Who are the greatest photographers and what have their contributions been?This book takes the 50 most important aspects of photography - both the major styles and the key technical aspects that make them possible - and explains each in two pages, 300 words and one picture. The book also inclu… des six profiles of the greatest names in the history of photography and shares their contributions. 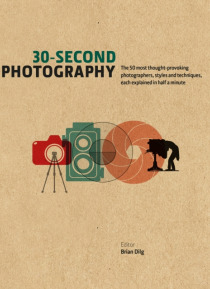 Whether you pick it up for 30-seconds at a time or read it from cover-to-cover, this book is guaranteed to have you thinking about your own and other people's photography in a whole new way.